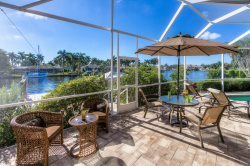 This beautifully updated SE Cape Coral vacation home is located on a sailboat access canal. Nestled into a very quiet and upscale neighborhood and located on a cul-de-sac street. The property features 3 bedrooms, 2 bathrooms - one of which serves as a pool bath. The great room style floor plan with upgraded kitchen featuring stainless steel appliances as well as granite countertops and an island overlook the swimming pool and the canal. Enjoy and relax and watch Tv in the recliner in the living room. The master bedroom features built in cabinets. The swimming pool and pavered patio face west for beautiful sunsets as well as cocktails on the extended lanai or boat dock. Diese Ferienvilla liegt im Sued Osten von Cape Coral, direkt an einem Segelboot Kanal. West Lage, 3 Schlafzimmer, 2 Baeder, geschmackvolle Einrichtung mit gemuetlichen Moebel und Accesoires. Das Wohnzimmer sowie die Kueche bieten hohe Decken und viel natuerliches Licht, der Swimming Pool ist elektrisch beheizt und hat West Lage. Atemberaubende Sonnenuntergaenge koennen von dem Haus eigenen Dock oder der Terrasse mit einem kuehlen Getraenk genossen werden. Was one of the easiest processes to book rental.